Invisalign® clear aligners can be your path to clearly beautiful pearly whites. “I don’t want metal braces at my age.” With Invisalign treatment, you don’t wear metal braces. 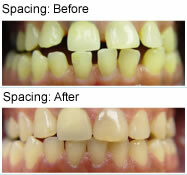 Instead, your teeth are straightened by wearing a series of virtually invisible plastic aligners. Almost no one can tell you’ve got the aligners on (unless you tell them). “It’ll be too much trouble.” Invisalign treatment is easy. You’ll receive a series of clear aligners, which you’ll wear for about two weeks at a time. You wear them all the time, except when you’re eating, drinking anything but water, brushing, and flossing. “It’ll be too expensive.” Invisalign treatment is often similar in cost to traditional braces. In addition, if you have orthodontic coverage, Invisalign treatment is often covered to the same extent as traditional braces. It’s the clearly beautiful way to straighten your teeth—at any age. Like many adults, you might feel that your teeth aren’t as straight and healthy-looking as you wish they were. You may have worn braces as a teenager, but because you stopped wearing your retainer at some point, your teeth have relapsed over time. 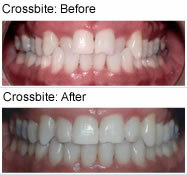 So now they’re a little crooked—doctors call this “malocclusion.” It’s a very common problem among adults. You’ve probably seen ads for Invisalign aligners—the clear way to straighten teeth and create a healthy smile. It’s safe, easy, and relatively quick—the average treatment lasts about one year. And, because the aligners are virtually clear, almost no one can tell you’re in treatment unless you tell them. By using a series of clear, removable aligners, Invisalign treatment straightens your teeth right before your eyes. Change the aligners about every two weeks and your teeth will move, little by little, toward the smile you’ve always wanted–one that everyone can see! Invisalign aligners are comfortable to wear, and don’t require you to change your busy lifestyle. You will visit our office every month or two to check your progress and get a new set of aligners. Because the aligners are removable, you can continue to eat your favorite foods while brushing and flossing normally to keep your teeth and gums healthy. 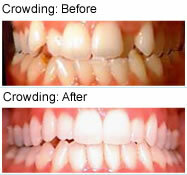 Be one of the many patients we have treated who are enjoying their new smiles. Contact us today for a free consultation—don’t wait another day to give yourself the gift of straight, healthy, beautiful teeth!